Nittanyville is nothing short of epic right now. This is the biggest game of the year, that we have coined the “Ineligibowl.” Nittanyville is at record numbers, with nearly 1,200 students and 142 tents. That electric feeling is in the air in Happy Valley. Lets see how loud we can get on Saturday night, and show Ohio State who belongs at the top of the Big Ten this season! 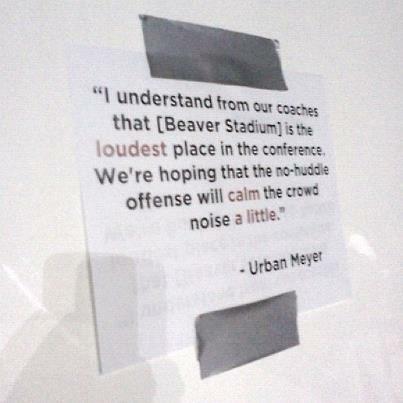 Check out the quote posted at Nittanyville in the picture above from Ohio State head coach Urban Meyer, if you need a little motivation to get loud on Saturday! The Wienermobile is coming to Penn State! Penn State: "We Are Not Normal, We Are Legends"
A note to the Penn State Students, Alumni, and Fans.